Since the petrol subsidies have been reduced, some of our favourite food places have raised their prices! So Hubby and I decided we would eat breakfast at home more. Our norm used to be to go marketing and sit down for leisurely a meal in a shop. As creatures of habit, some places would not even wait for us to sit before the staff call out our usual orders for food and drink! Nowadays however, we have shifted emphasis and prefer to stop at home after the school run. This is one such breakfast. Double sunny-side up eggs done in minimal oil and a non-stick pan. A tablespoonful of baked beans. Lightly toasted wholemeal bread, sometimes with cheese. Other times, like this, with garlic and herb spread. Slices of tomatoes, cucumbers, leaves of lettuce and in this dish, the last of some delicious ham from Australia! Yummmmm! Each breakfast at home begins with freshly blended juice and chia seeds. It ends with black coffee – no milk, no sugar. Just that and nice company! 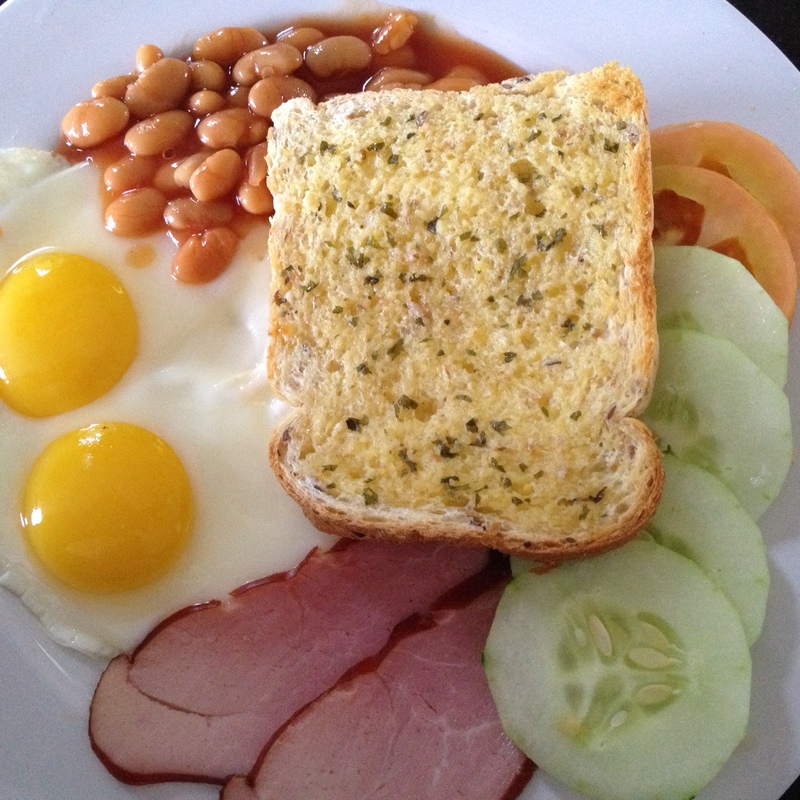 This entry was posted on 01/10/2013 at 21:54 and is filed under Family, Gastronomy, Lifestyle. You can follow any responses to this entry through the RSS 2.0 feed. You can leave a response, or trackback from your own site.